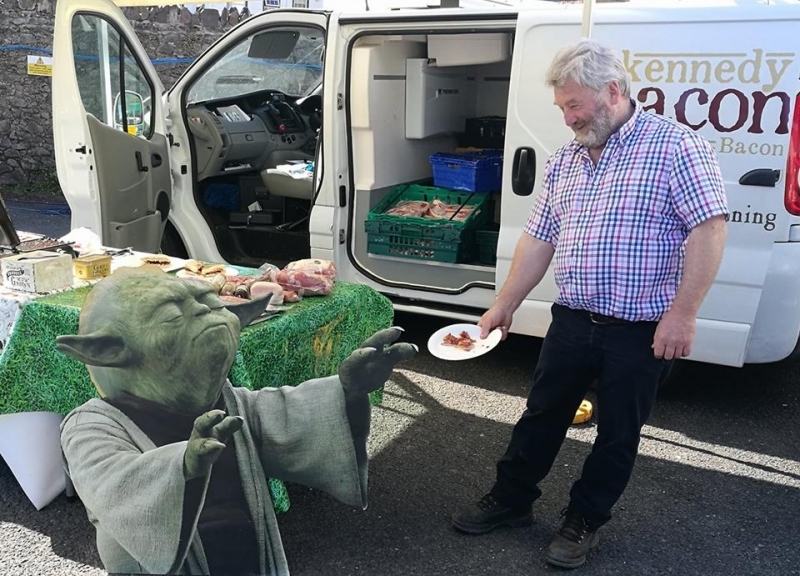 September is ‘Bread & Baking’ Month in the NI Year of Food and Drink 2016 so Comber Farmers’ Market are celebrating by featuring the Krazi Baker as our producer of the month. Owner Mark Douglas tells us a bit about his business. I started 3 years ago but I am only full time 18 months. What drove you to become a local producer? My driving force to do what I am doing came from a simple thought of wanting to bake on site. This was fuelled by seeing the skill within the home baking trade being diminished by the onset of the premix where no skill was needed to bake a range of pastries and cakes and now even into bread. I felt strongly that I had a skill that was being devalued along with the traditional methods that had been passed down through generations. Tell us a little about your working day? My typical working day to go to Comber market will actually start the day before. I have to load the van with gas, flour and make sure I have all my equipment onboard. On a market day I will be up from 5am doing last minute stocking, filling iceboxes and hot water for the sink. Picking George up a 6am we arrive in Comber around 6.30am, set the marquee up taking about 30 mins then light the hotplate which is ready for baking around 7.15. The first customers arrive for 9am then bake right through to 12.30pm. The market ends at 1pm then pack up time leaving Comber at 2.30pm home for after 3.00pm. Unload the van and time to wash up which takes around an hour. What is your personal favourite product that you make? My favourite product would be potato bread I love it toasted or cold but especially love it with scrambled eggs. It always reminds me of home when mum baked 3 days a week for a family of 8. 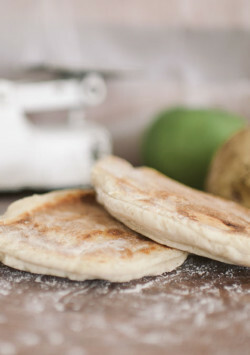 The smell of potato bread and soda bread just has an attachment to home for me and for so many people in N.Ireland and tells us why they are a massive part of our food heritage. This has been a massive physical and mental challenge to get this far even as a one man show. To start out with a simple idea then the next biggest challenge was where do I do this baking on site? 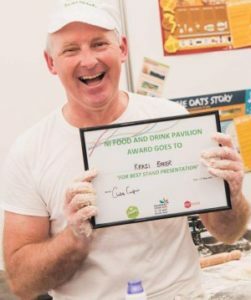 Being refused entry to markets and shows in the beginning I have persevered and have since won 4 Great Taste Awards and best Stand in the FoodNI pavilion at this year’s Balmoral Show. I have also started a small baking school at home taking up to 7 people teaching the skill of Artisan hotplate baking and much more. Mum has been baking buns and cakes for friends and family for years, and when I became a mum myself, I too took on the baking bug and about three years ago we decided to start the business. We have always been doing our bit of home baking, but we were becoming increasingly frustrated with the quality of so called ‘home baking’ on sale in most shops. 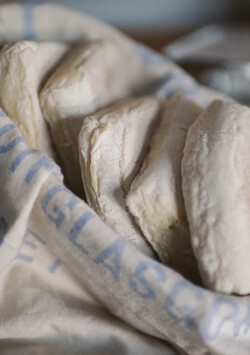 Due to mass production a lot of the bakery products had become bland and full of artificial flavours and preservatives. We felt that good home baking was going to become a thing of the past if these large commercial bakeries took over, so we decided we wanted to sell our little bit of traditional home baking, just like granny used to make! We are a mother and daughter team and most days are spent in the bakery. We have a small home bakery based on our farm just outside Moneyreagh which is open Friday and Saturday morning from 9am – 12noon every week. We spend the week re stocking with traybakes and biscuits as well as keeping the freezer stocked with our wide range of desserts. We also supply Woodlawn garden centre with our delicious desserts which are delivered fresh throughout the week. We have weekly orders as well for celebration cakes and cupcakes. We are currently expanding the outside catering side of our business, and we can provide sweet and savoury food for any occasion. We were delighted to have received a Great Taste Award last year for our butter shortbread which we love, however Almond slices would be my personal favourite and mum loves a slice of apple tart. At Farm House Treats we strive to keep our products as fresh as possible. We want our products to not only look good, but to taste great too. Everything is prepared in small batches and we are using traditional recipes passed from generation to generation. We are delighted with the business we do on a monthly basis at Comber Market and we now have a regular customer base who return each month to stock up on our treats. The market is a credit to its organisers and we look forward to trading here for many years to come! Farmhouse Treats can be found at Comber Farmers’ Market the first Thursday of every month. 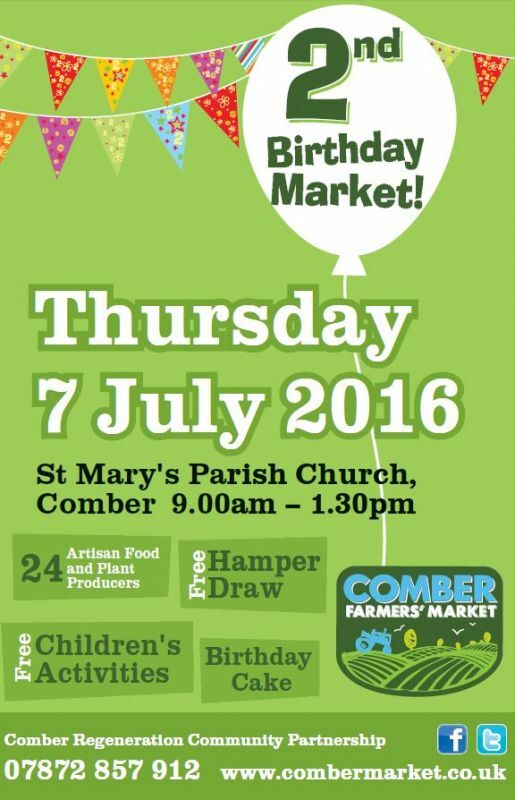 Comber Regeneration Community Partnership, the organisation that runs the successful artisan food and plant market in Comber, is celebrating the 2nd birthday of Comber Farmers’ Market on Thursday 7 July, St Mary’s Parish Church, the Square, Comber, from 9.00am – 1.30pm. In addition to our regular food and plant stalls, we welcome the Hanna family who have a milking herd of Jersey cows on their farm on the Hillsborough Road outside Carryduff. They will be selling their certified and registered creamy, raw milk which is packed full of goodness and health benefits. There will also be free activities for children, a free hamper draw, and birthday cake for some lucky customers (while stocks last). So come along and celebrate this significant milestone in the life cycle of our popular market which is helping to regenerate Comber and support our local food producers who are selling their top quality products at fair market prices. 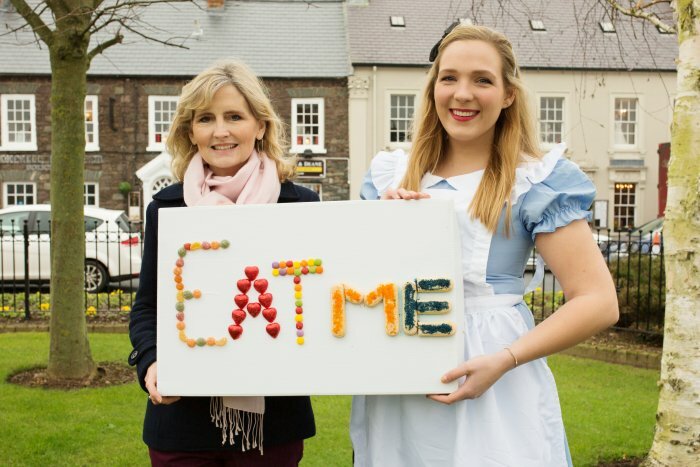 Comber Farmers’ Market has teamed up with NI Food Tours to bring people to Comber to sample and taste a variety of different foods which are available in and around the town on Thursday 5 May 2016. The coach tour will leave Ards Visitor Information Centre, 31 Regent Street, Newtownards at 10.00am, travel to Comber to visit Comber Farmer’s Market followed by morning tea or coffee, home baked scones and cakes in St Mary’s Church Hall. 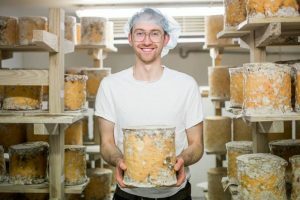 After a brief walk across the Square to Indie Fude Deli, guests will be treated to a cheese demonstration by Michael Thompson who makes his Young Buck hand crafted blue cheeses in Newtownards. The group will then be picked up by the coach again and taken to The Old Schoolhouse Inn on the Ballydrain Road where award winning chef Will Brown will be cooking them a gourmet two course lunch before returning to Newtownards for 3.00pm. 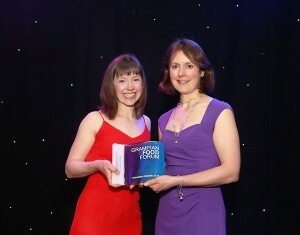 The Good Granola Company that attends Comber Farmers’ Market every month has won the Best New Retail Product for businesses with up to 25 employees at the recent Grampian Food Forum Innovation Awards. Organised by Grampian Food Forum, the awards celebrate excellence and innovation in food and drink in Aberdeenshire, Aberdeen City and Moray. 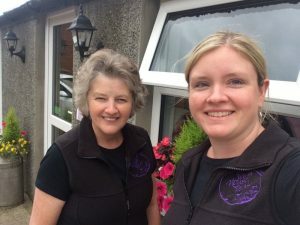 This is the second time that this entrepreneurial business has been recognised as it was shortlisted in the ‘My Country Business Awards 2015’ which is organised by Country Homes and Interiors. 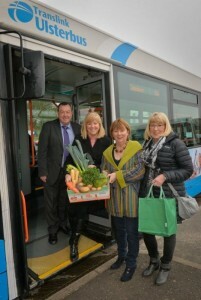 Comber Farmers’ Market is encouraging Bangor and Newtownards residents to take the bus to Comber Farmers’ Market which is held on the first Thursday of the month in St Mary’s Parish Church car park, the Square, Comber from 9.00am – 1.30pm. Alderman Deborah Girvan who helps to run the artisan food market on behalf of Comber Regeneration Community Partnership explained, “On market day, the car parks in Comber fill up very quickly and people often complain that they can’t get parked. I would like to encourage our local market goers, especially retired folk who can use their Smartpass, to leave their car behind and take the bus. Translink service Delivery Manager David Graham said, “Travelling by bus is a relaxing way to enjoy your day out. We are pleased to team up with Comber Farmer’s Market to encourage more people to use Ulsterbus services to reach the town, pick up some shopping, catch-up with friends and enjoy the lively market atmosphere. If you’ve a 60 Plus or Senior Smartpass you can also enjoy the added convenience of free travel. Our customers can also enjoy the benefits of an Ulsterbus Smartlink card with savings of around 30% compared to cash fares,” said David. An Ulsterbus Service will depart Bangor Bus & Rail Centre at 10am for Newtownards where customers can transfer onto the 10.30am service to Comber (arriving at 10.45am). A return service from Comber to Ards departs at 1.05pm with a connection onward to Bangor at 1.30pm. 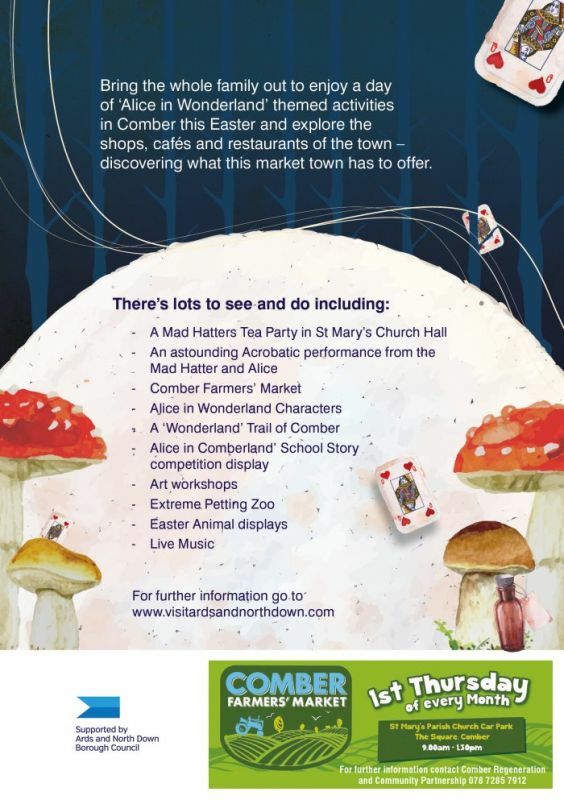 Come and eat lots of lovely food at Comber Farmers’ Market at Curiously Comber event on Thursday 24 March. The market will open at the usual time of 9.00am but opening hours will be extended until 4.00pm. There will be 24 stalls selling artisan food including cheese, jams,chutneys, oils, olives, breads, bacon, beef, cakes, eggs, fish, fruit, vegetables, granola, pies, tarts, quiches, and chocolates. In addition there will be bedding plants and unusual garden shrubs and spring bulbs to buy. 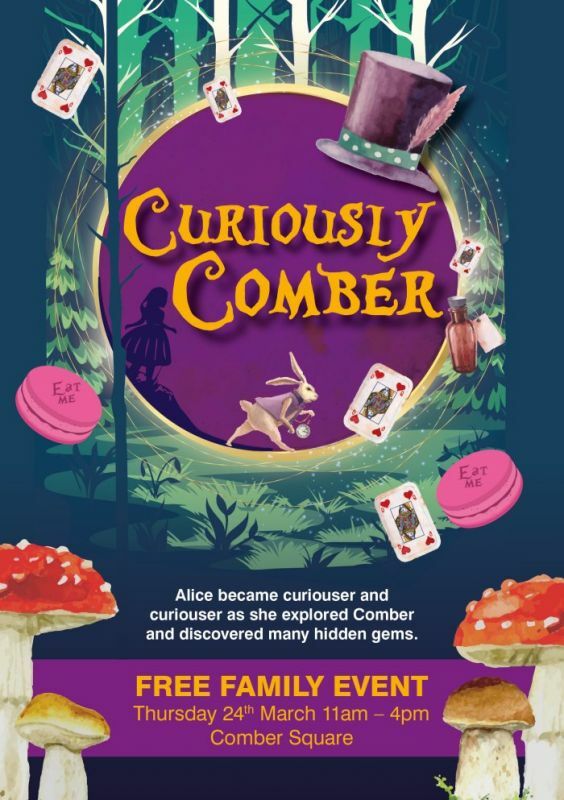 Satisfy your curiosity and look for the hidden gems at Comber Market that you won’t find anywhere else! Don’t miss this free fun day! 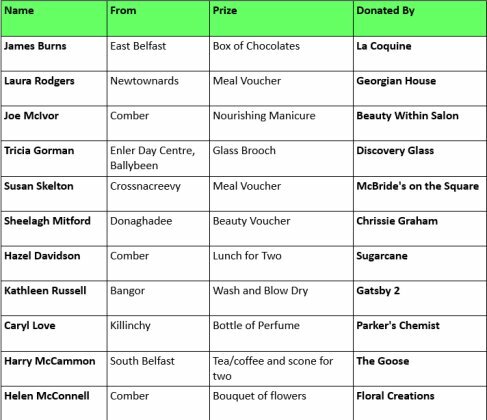 Congratulations to all the prize winners of the Free Prize Draw which was held at Comber Farmers’ Market on Thursday 3 March. A BIG thank you to all the businesses of Comber for their kind donation of prizes and helping to make the market such a success. As part of the NI Year of Food and Drink, March is the month that celebrates our food heritage and traditions. Find them all at this month’s market on Thursday 3 March! We have soda bread, wheaten farls, potato bread, and apple cakes made on the griddle by the Krazi Baker. There’s grass fed beef, dry cure bacon, kid goat meat and venison. From the dairy there’s free range eggs and handmade cheeses. There’s jams, chutneys and preserved fruit. There’s soup vegetables, turnips, cabbages, carrots, parsnips and of course our Comber potatoes. There’s indigenous plants and shrubs to plant in your garden or pot on in your greenhouse. Come and meet our local food producers and hear their story on how they rear, grow, bake and make traditional Northern Ireland food using farming and production traditions that have been handed down through the generations.